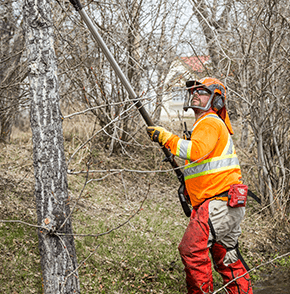 Mulching & Tree Clearing in Alberta & Saskatchewan | Pevach Corp.
We all like trees, right? Making air, dropping fruit, making it so tree-houses aren't just houses. All good stuff, but sometimes trees and brush needs to go before they end up in power lines or becoming a safety hazard. 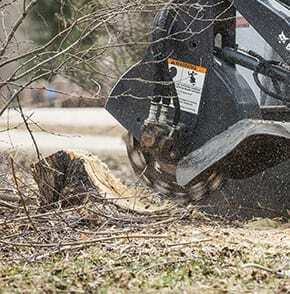 Our fleet of nimble and powerful equipment can make the roots of a mighty oak into matchsticks – check out the CMI 250, a 275 horsepower workhorse that’s a mainstay of our fleet. Or, take a gander at our CMI 175, a mulcher that’s known as being one of the best in the business. 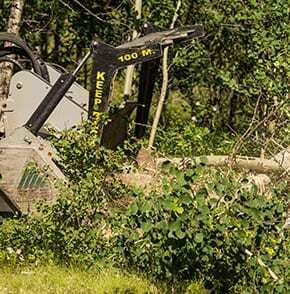 Plus, we’ve got powerful tree clearing and mulching attachments that allow our T870 Skidsteers to charge through trees, clearing an area for good in minutes instead of the years it takes to wait for a stump to rot or to slash and burn a patch of ground (and there’s no air pollution or chance of starting a wildfire). And because our fleet is mounted on tracked vehicles we can get in and out of anywhere—meaning that we can take on jobs that other companies can’t. Creating access for oil and gas pipelines or keeping electrical lines free of trees is an easy job when you’ve got the kind of toys we have at Pevach. We can handle the toughest jobs for the biggest companies, while being on time and on budget. If your company or municipality owns/operates a golf course that needs less golfers searching through trees for golf balls, or if you’re a building a new office, home or park, we’re here to help you get the job done right. We can create world-class green spaces fast, leaving the work site clean and tidy. If you have trees, stumps or brush on your home or acreage and you don’t want the expense and worry of clearing the area yourself then we can help you out. We turn up on time, get the job done right and leave no mess- every time, guaranteed.